I'm sure it's a technical fubar. I have one entry in my Google Calendar for a trip up to St. Andrews tomorrow. I like that Google sends me a text message/SMS for Google Calendar alerts - they're so much harder to ignore than email alerts. 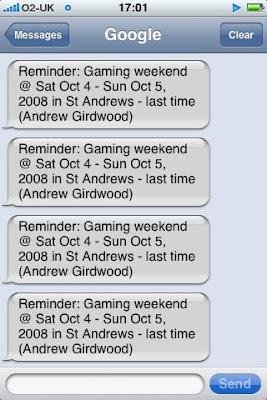 I'm not so keen on my single weekend entry causing a string of a half-dozen SMS messages though. ... at least the alerts seem to have stopped for now. Did anyone else receive more than necessary Google SMS alerts today? Not me. But google had recently sent me message from adsense that they sent me my adsense pin.